The charts you build by choosing Graphs→Graphboard Template Chooser in SPSS are similar to those you build by using the other menu selections, but you get less guidance along the way. The way you begin is a bit different. You indicate the variable you want to use, and the menu shows you all your choices for that combination of variables. You want to make maps. Maps are not possible in Chart Builder, but they’re popular in Graphboard Template Chooser. You need some way to align your data to the map, so you need a variable like State or County. If you don’t own Visualization Designer or need to make a map, it’s best to stick with just one approach. 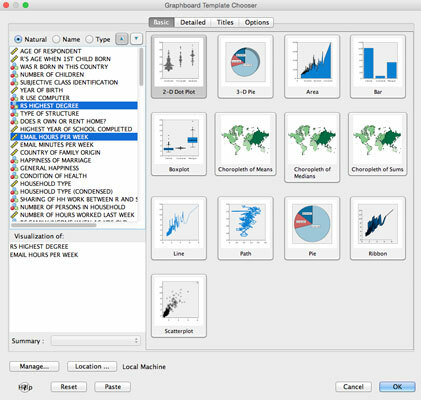 First, you select the variables you want to include (Ctrl+click to select multiple variables), which causes the available kinds of charts (such as bar, dot, or line) to appear onscreen, as shown here. Using the tabs at the top of the screen (Basic, Detailed, Titles, Options), you can choose screens that allow you to set the options. Note the three “choropleth” options. Those are your maps, but the GSS Survey dataset has broad regions, not more ­specific geographic info, so mapping is not an option with this data. The Interactive options for constructing a bar graph. If you get things balled up, it’s easy to restart. The Reset button removes everything you’ve entered in all the tabbed windows and restores all the defaults. The Help button provides some information about whichever list of options is displayed at the moment.